I swear by Trader Joe’s Frozen Mac and Cheese. It is delicious. I like to avoid the need for plates and forks, so I came up with this to make the tomato the vessel. 30-45 minutes from oven to plate. This is easy enough to start 45 minutes before your guests arrive. Heat oven to 400 degrees and cook Mac and Cheese for 30-40 minutes depending on your oven. Slice the tomatoes in half and use a spoon to scoop out the seeds. 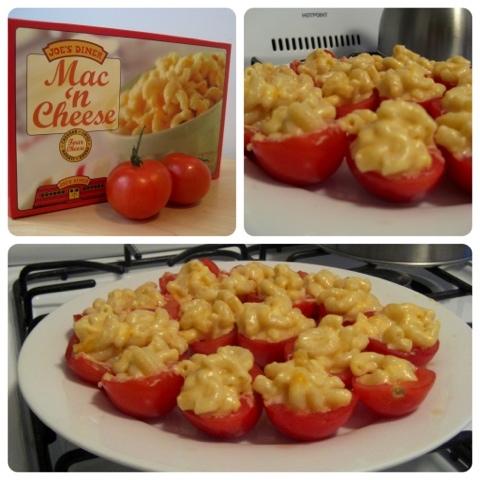 Simply spoon the cooked Mac and Cheese into each tomato and serve on a plate. I like the way the cool and crisp tomato works with the warm and creamy Mac and Cheese. To take it to the next level, add in bacon or mushrooms cooked the night before and mixed in once Mac and Cheese is warm. Enjoy! Previous Postice bucket? I don’t have an ice bucket!